For anyone with an interest in how to run their business more creatively. 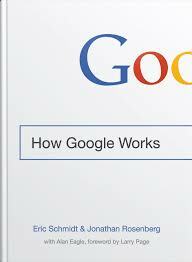 Read How Google Works. This is a little cracker of a book. Written by Eric Schmidt and Jonathan Rosenberg who were both with Google from almost its outset in around 2001 and rose through the ranks to become CEO and Senior Vice President respectively. In it they tell us how to manage “smart creatives”, typically engineers and coders in their world but smart creatives can be found right through an organisation as they are the people that think about problems in all sorts of areas. It has a surprisingly lighthearted tone for an American business book and manages to make light of what is a pretty dry subject. Although some of the anecdotes and tales of the creation of things like the Google Driverless Car, Gmail, Google +, and Google Maps have you thinking “well it’s OK for Google to do this given their vast resources and unrepresentative company culture” (drilled down from the very top) you also find yourself saying “why not” a lot. Why shouldn’t I aspire to, and initiate, a business culture in my organisation that is egalitarian, meritocratic, relatively non hierarchical despite its hugeness. I know for sure I’ve tried to do this wherever I have had any influence over this sort of thing. The book shares real world examples of cultural good practice, how to enhance staff retention and how to celebrate failure. It demonstrates a great deal of the benefits of Lean business thinking and Agile working, where speed is of the essence, and it builds to something of a climax in the sections on communication and innovation – 20 percent time where employees get to work on an initiative of their own, outside their core work stream – this is what really drives innovation at Google. For me though, the most interesting aspect of the book is the dissemination of how Google fights for its unique culture. It’s a great read and I recommend it wholeheartedly.